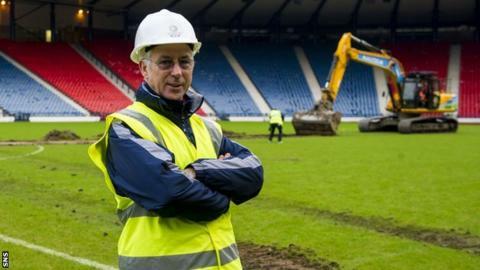 Glasgow 2014's head of venues development, Ian McKenzie, has defended the decision to use Hampden for athletics at the Commonwealth Games as work begins to install a track. "We have a very good athletics stadium at Scotstoun but it doesn't have the spectator capacity that is required for a Commonwealth Games," he said. "In Hampden we have a stadium that is in the right shape - a bowl shape. "It's the most easy to convert into an athletics stadium." McKenzie argues that Glasgow is "very well served by three world-class stadia" in Hampden, Ibrox and Celtic Park. He added: "Glasgow's Games will have no white elephants, and another stadium that accommodated 40,000 is something Scotland doesn't need." Work has been completed on the North Stand to improve access, but Tuesday morning was when the diggers moved in to remove the turf and begin constructing a platformed track that will extend into the current seating area to satisfy Commonwealth size requirements. "To achieve [a large enough track] we have to build a platform 1.9m above the existing pitch level," explained McKenzie. "To do that we are going to use a system that is a combination of posts and beams. "These are steel and specially designed for raising the platform and on top of that we will build the athletics track." The combined cost of renovating the national stadium and neighbouring Lesser Hampden will be around £27m. And David Grevemberg, chief executive of the 2014 organising committee, described the work as "innovative". He said: "This platforming system has never been accomplished on this scale so there is a degree of risk in the project but it's a risk worth taking. We are very confident that we will deliver. "We have done a lot of testing, we have worked very closely with the IAAF [International Association of Athletics Federations]. They are very excited about it, as are we, with this solution. "It will really open the world of athletics to so many more stadia around the world. "It's pioneering so there is a lot of keen interest, both from an architect's standpoint but also from an athletics enthusiast's standpoint." There have been some complaints that the remedial work to return Hampden to a football venue will mean there is no athletics legacy from the Games. However, McKenzie believes the right decision has been made. After highlighting the existing facilities at Scotstoun he said: "We've helped fund a new clubhouse for Queen's Park Football Club. "We will be demolishing their old temporary facilities and after the Games, when we take out most of the warm-up track at Lesser Hampden, we are going to leave the sprint straight there for the community to use." The Scottish Schools Championship in May will be run as a test event once the conversion work has been completed, and there remains the possibility that the stadium could host a Diamond League meeting two weeks before the Games. Para-athlete Meggan Dawson-Farrell, who competes in the T54 1500m, is looking forward to racing on the new track. "There's no turning back now. It's exciting. It's nice to know I'll be here again next year competing on home soil," said Dawson-Farrell, currently recovering from a rotator cuff injury. "It will be nice to be cheered on but at the same time it will be scary. You want to do well but you have to use that to your benefit to pull you round."